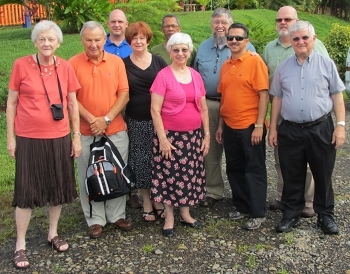 Pastors and LendAHand team members gathered at the Monte Getsemaní retreat center in Costa Rica. 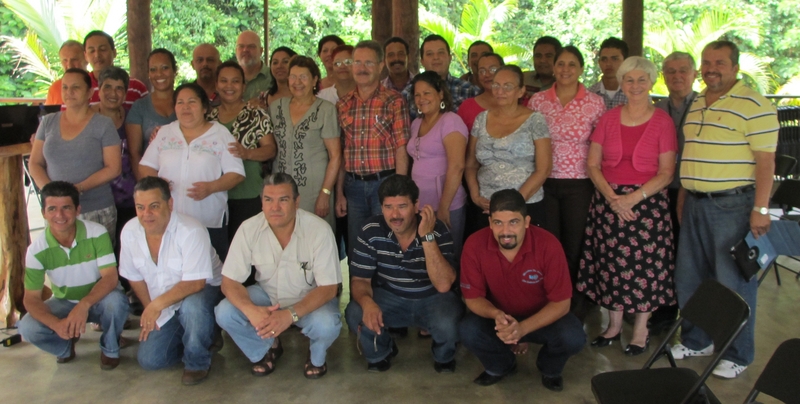 The three people at the extreme right of the group are (left to right) Kathryn Hoyle, Bobby Hoyle, and Pastor Jorge Fernández. What you may find even more interesting is this episode’s interview with LendAHand Mission Teams founder and leader, Rev. Bobby Hoyle. Bobby was our team leader and made the arrangements for the trip. The story of how he got involved in missions late in life, how LendAHand was formed, what it does, and how God is using it will be inspiring to many. And let’s just say that Bobby is a man who has a very… well, let’s say unconventional… definition of “retirement”! In the interview (which starts at approximately 18:30 in the broadcast), Bobby gives a special word of thanks to Kingsway Charities, so be certain to click through and visit their website and learn about their ministry. Their primary focus is international medical missions. Dr. Raymond Rempt, one of my two fathers in the Lord, is the founder of FigTree.net, and the author of Never Before, Never Again: Getting Your Feet Wet in Missions. The book, which highlights the unique opportunity God is offering for involvement in short-term missions, is available from Amazon.com, or, if you’d rather purchase a copy directly from Ray, drop him a line. E-mail: Click here for e-mail. Next episode, Lord willing, we'll be back on track with our study of 1 John, chapter 2, introducing the topic of antichrist in a way you've probably never heard it — in context! Podcast theme music: “Steam Train” from the John Williams album Dusty Porch, under license from Magnatune.com. Photos were taken by the author. Cover of Never Before, Never Again, is used by permission of Dr. Raymond D. Rempt. I just finished listening to this episode and you ended with an encouragement for folks to go on a short term mission trip if they’re able. Thanks for the encouragement and for the link. Folks need to engage with the GO in GOspel! This podcast really shares the heart of LendAHand — ministering servant hearts reaching out to serve others and share God’s love. I might add one more thought to what is shared toward the end of the podcast as far as the benefit of the money spent for missions trips, that is, that the perspectives, lives and hearts of those who go on these trips is forever changed. There is also great benefit for the people being ministered to, since we are offering skills, services, and teaching that the people do not have or do not have access to themselves. God is glorified as His body works together to build His church. I know that’s been true of every trip on which I’ve gone, starting with my India trip in 1984!